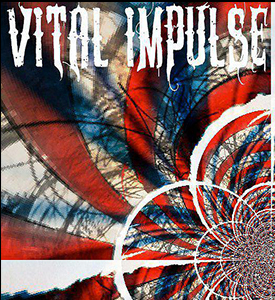 Vital Impulse (Rob Nace born July 13, 1992) spent his childhood living in a trailer in Mechanicsburg, Pa. Around the age of ten he relocated to York, Pa where his personality and interests started to emerge. He tried many things of the years to express his talent. Through the years he tried soccer, football, drawing, Tae Kwon Do, skateboarding, and was in three different technical classes in the Vo-Tech he attended in High School. After graduating High School he left to go hitchhike the country, and experience the world for what it is. During the 7 month adventure, He started out sleeping where ever he ended up and made it to his destination (California) in one week. Three months into the trip he used the rest of the money he had saved to buy a used car off craigslist. Afterwards he continued gas jugging around California experiencing the life on the road. During this adventure is when Vital started to emerge as a Rapper. He made most of his money on the road by rapping to people on the street, and selling hemp jewelry that he and his girlfriend made by hand. In late December of that year he returned to York, Pa and started using his lyrical skills to make music a few months later. Since then he has progressed more and more with each passing day. His topics range from; events that occurred throughout his life, His feelings toward certain aspects about people and things going on in the world, to his opinions on how the government is run by the ones we have in trusted with our nation. Vital Impulse speaks the truth and is just flat out real about how he feels from every angle of life. He has just recently dropped his debut mixtape â€œA Nation In Distressâ€ and has much more to come. Join the movement Vital Impulse V.I.P.